Good morning. Well it was when I started this. Morning that is. Having lulled us in to believing that maybe, just maybe, summer is on the way the last couple of days, the rain has returned. Again. Anyway, we are in Denbighshire, near Corwen on a lovely little, but sadly nearly empty site and are here until the weekend when we cross the border back to England for our penultimate stop of the trip. Right, catch up time. We had two full days in Anglesey and If I was to sum them up by saying we drove around and it rained it wouldn’t be too far from the truth. It certainly won’t go down as the most enjoyable stop of the trip, largely because of the weather but anyway, here goes. Thursday, and at least a dry start. 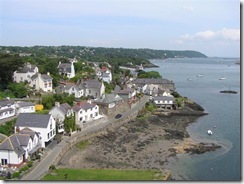 We called first at the lovely neat town of Beaumaris before crossing the Menai bridge and paused for photo’s, at the beautiful Menai Strait below. 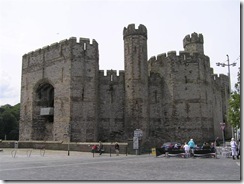 Next up was Caernafon, wedged between the Strait and the Snowdonian mountains it is the castle that is the draw here and of note because of it is where Charlie boy was invested as Prince of Wales in 1969. The largely nationalist locals where apparently not entirely enthralled by the prospect of having big ears foisted upon them and tried to blow up his train. Or so the story goes. 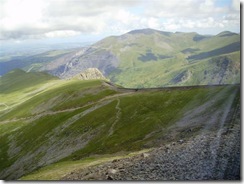 We continued south, skirting the Snowdonia national park and calling at Portmadog for a cuppa. 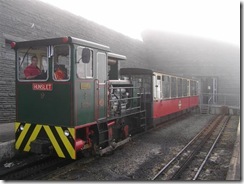 It is here that two of Wales’ narrow gauge railways converge at a charming little station by the harbour. We stopped for a snack and a cuppa and watched a few trains come and go. We took a slightly different route back; through part of the national park and following roughly one of the little railway lines. The road was narrower and twistier but the scenery was stunning. At least it was when the windscreen wipers had cleared the water off the screen for long enough to see it. 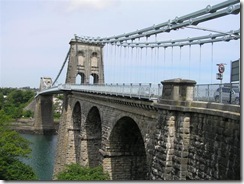 A friend had recommended a pub by the newer of the two bridges crossing the strait back to Anglesey. We called in for a pint on the way back and it was one of the nicest, and certainly cheapest pints we’ve had. Cheers for that Kev! Friday. We didn’t have to wait for the rain to start today, but undeterred we headed out again, this time to Bangor, right on the corner of North Wales. Now I’m sure the weather didn’t help but it wasn’t the most memorable of stops. Pretty depressing in fact. 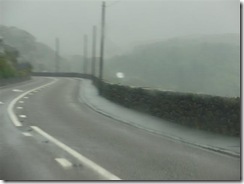 In desperation and driving rain we went to Holyhead on the tip of Anglesey and the gateway, at least by ferry, to Ireland. 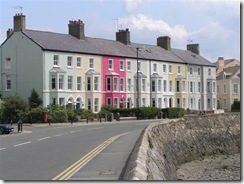 Well, if Bangor was depressing, Holyhead was suicidal. There was lots of boarded up shops and the whole area had a feeling of decay about it. Possibly part of the reason for this lay a little further back along the A55 in the shape of a massive retail park. Town planners give the go ahead for these massive out of town retail parks then wonder why town centres suffer. Muppets. A little light relief came later on, thankfully. 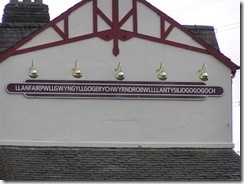 Anglesey is home to that town with the absurdly long place name that only those blessed with an acrobatic Welsh tongue have any hope of pronouncing properly. Even in the wind and rain, there was no shortage of tourists like us taking pictures. So, here it is, something long to try and wrap your tounge around: Llanfairpwllgwyngyllgogerychwyrndrobwllllantysiliogogogoch. Thank gawd for ‘copy and paste’! Saturday and time to leave, and course it was raining. Lots. There was no way that the car would have hauled Patsy off the sodden grass so we positioned the car with the front wheels on the tarmac road and motor moved Patsy towards the car, keeping the weight off the jockey wheel to stop it burying itself in the quagmire. It went surprisingly well. We got hitched up, completed the pre flight checks then went to have a hot shower and defrost. After our ‘welcome’ on arrival at the site I wasn’t exactly expecting hugs and kisses as I went to hand our key in on departure and I wasn’t disappointed. A ‘good morning’ and a ring of the bell above the door announced my arrival in reception but the warden, who had been joined by an accomplice were clearly engrossed in a print out in front of them. I waited patiently for a couple of minutes thinking at least one of them would acknowledge my presence but clearly the aforementioned print out was more important. I placed the keys on the counter in front of them and left. It was only 55 miles to the next site but felt like 150. The weather was truly appalling and I’m glad Trev was driving. 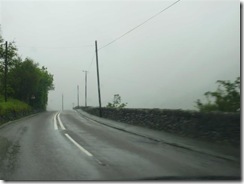 The rain fell heavily and water gushed down mountainsides, over walls and on to the road. Several places had already flooded. The worst journey of the trip so far, but we arrived unscathed and received the far more usual pleasant welcome. 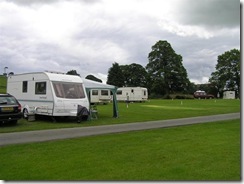 The site was about the smallest we have been on – just 35 or so pitches, but one of the nicest. The rain eased as we set up for the week. How thoughtful of it. No sightseeing Sunday, but it was largely dry so we got the awning up and Patsy and even the car got a much needed wash. Plenty of departures from the site today and there are now only five vans here. It’s a shame because it is a lovely spot but perhaps slightly out of the way, although given the the fact that all caravanners by necessity have a means of transport with them it shouldn’t be a factor. 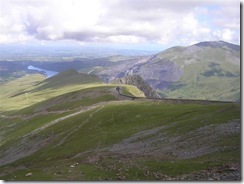 Monday, and back on the tourist trail, this time to the summit of Snowdon via the pricey but thoroughly enjoyable mountain railway. 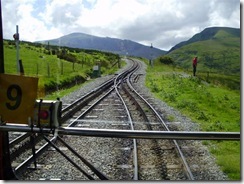 It takes an hour or so on the little narrow gauge rack and pinion railway built by the Victorians. Nowadays diesel engines share the load with their steam counterparts but it’s a great trip nonetheless. 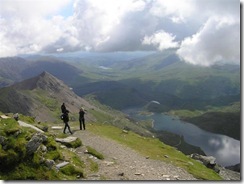 We were in fact planning to do this whilst in Anglesey but it was all booked up. Just as well given what the weather would have been like. 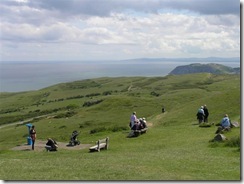 The views from the summit are of course stunning, looking out on some of the most beautiful scenery in Britain. We paused for coffee and a toastie in one of the many cafes at the village below before heading back. The drive to and from was without doubt one of the prettiest we have done and the most enjoyable, suicidal tailgating Celts notwithstanding. Something else worth a mention too are the roads. 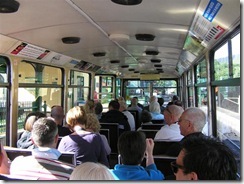 Whilst some are narrow by necessity they are well maintained – Scotland take note. This may however be due in part to local councils charging for parking at every opportunity. In one place, even to stop for a couple of photo’s was going to cost us – ‘you pull in, you pay’ should be the motto. They need to watch that they don’t overdo this and put people off coming. Tuesday. 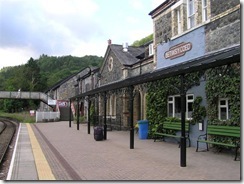 another train today, but this time on a more conventional one, from Betws-y-Coed up to Llandudno to meet up with friends. The journey was pleasant going through yet more stunning countryside and picture postcard village though I do feel that after nine weeks I’m beginning too grow immune to all this. 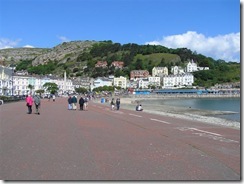 We were however pleasantly surprised by Llandudno – as smart and as tidy as Eastbourne but with a younger clientele. We stopped first for coffee and bacon butties at our favourite restaurant, (er, Greggs), then checked out Llandudno’s little pier. At the end of the pier some fishermen were checking out their tackle too. 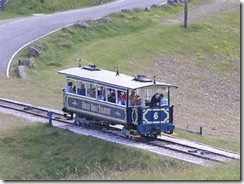 Next on the tourist trail was the tram that takes you from the edge of the town centre up through winding little streets to the nature reserve up at Great Orme. 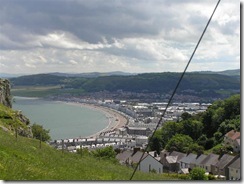 You get a great view of the town and surrounding area and it is a great place to stop for a picnic. If you don’t have Hayfever that is. We are moving in to that time of year when the various pollens combine forces to try and make my life a misery. A collection of drops. sprays and puffers, combined with living on the coast usually keeps things at bay, but I was a little caught out up here. Medicinal refreshment was clearly nearby and an excuse, sorry, opportunity presented itself as we met up with friends for drinks. 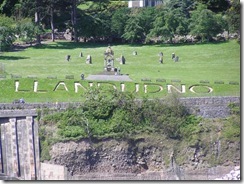 Chris (a.k.a Mad Aunty) and Brian made Llanddudno their home some fourteen years ago and still love it. We had a good catch up and went back to their place for coffee before heading back to the train and home. All in all a great day out. Well, as I finished up now, the rain has gone and the sun is out. Long may it last, though if the weathermen are right, I doubt it! 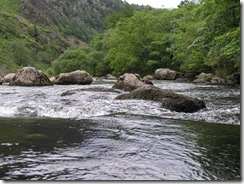 This afternoon, all being well we are going in to Betws-y-Coed to check out the waterfalls. On Saturday we move to Much Wenlock to meet up with friends who will be joining us in their vans too.